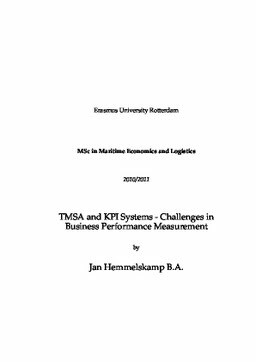 This thesis investigates whether it is feasible to merge the Shipping Key Performance Indicator [hereinafter referred to as: KPI] Standard and the Tanker Management and Self Assessment [hereinafter referred to as: TMSA] and, thus, to use the former standard for the performance measurements required by the latter. As both schemes are the outcome of quality awareness developments, the thesis begins with the description of applicable Quality Management Systems and then discusses the role of Performance Measurement and Management in achieving operational quality objectives. Following this introduction the thesis will focus on the tanker vetting and its requirements. The actual merging of the TMSA, which is part of the tanker vetting scheme, and the Shipping KPI Standard is done in a separate chapter. In this chapter the stages of the TMSA are identified for which the Shipping KPI Standard can be used, either directly or additionally in order to provide a framework to establish intra-company KPIs. This merged structure is examined in order to create an intra-company’s TMSA compliance verification system. The thesis closes with the description of a potential implementation process for Performance Measurement and Management, along with its issues and benefits for a company. This closing discussion focuses on the possibility of implementing a uniform methodology for Performance Measurement as well as on the usage of a Business Intelligence Tool for collecting and processing performance information. The described implementation strategy was developed through a case study of a mid sized shipmanagement company. The thesis draws the conclusion that the Shipping KPI Standard and the TMSA can be merged and that the Shipping KPI Standard can be used as a platform to establish an intra-company KPI Standard. A KPI platform based on the Shipping KPI Standard provides a uniform performance methodology and could form the foundation for an industry wide benchmarking approach. In addition it has been shown that the use of a Business Intelligence Software could assist a company in not only the standardising its internal Performance Measurement and Management methodology, but its data collection processes as well.